Attic fans are an economical and integral part of making your home more energy efficient. Most homes are built in our area with a ridge vent. 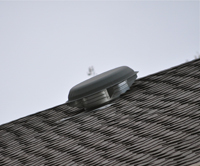 A ridge vent is a passive system that theoretically allows air to escape naturally from the attic. Even with a ridge vent, temperatures in the attic can exceed 150 degrees in the summer. It simply is not effective at removing the heat we experience here in the south from the attic. This type of extreme heat can cause even more serious problems when air conditioning systems and duct work are in the attic. Improper attic ventilation will cause excessive usage of your AC equipment and is quite costly for your system to keep up in such extreme temperatures. In addition, the suns rays beaming down on your roof will cook the shingles from the outside and extreme heat in the attic will fry them from the inside, overtime diminishing the life span of your roof. These are all scenarios that proper attic ventilation can alleviate. Proper attic ventilation is also effective in balancing temperatures between the levels in your home and also cooling bonus rooms over the garage. A hardwired attic fan is most often the application we see fit for most homes. We recommend and install GAF 1600cfm fans that will typically work in up to 1500 sq ft of attic space, with a relatively steep roof pitch. Powered fans move the same amount of air regardless of conditions beyond the temperature in the attic, unlike the solar fans that move a varying amount of air depending on how much sun is hitting the solar panel. These fans use a nominal amount of electricity (equal to that of three 60 watt light bulbs, costing about $6 /month running 12 hours a day) and are the most efficient at cooling the air in your attic. They are thermostatically controlled, quiet when running., and have a low profile that blends well into your roof. Our products and installation are also guaranteed with a non-transferrable lifetime warranty on parts and labor. Solar powered attic fans have become increasingly popular as consumers become more energy conscious than ever because they don’t use any electricity to operate. However, certain conditions must be present in order to make it as effective and efficient as its electrically powered counterpart. Solar fans are most effective when installed on the southern facing roof section with little obstruction. Gable mounted fans are used when the roof is not easy to penetrate, i.e. slate roofs and tile roofs, hoa restrictions, etc. Proper intake vents are a critical component of any attic ventilation system. Additional soffit venting is required when there is not enough intake air in your attic. Not having enough intake air could lead to negative pressure. Negative pressure can cause air conditioned air to be pulled from your home or create a vacuum in the attic that will burn out a fan Our technician will assess your current intake air to determine if any additional venting is required. A minimum of 70 linear feet or 700 sq in. of intake air are required for a 1600cfm fan to prevent negative pressure.